Today we drove 45 minutes south of Blantyre to the district of Thyolo for a meeting with TAYO, the Thyolo Active Youth Organization. On the way, we passed the country’s tea estates, filled with row upon row of perfectly manicured tea bushes. 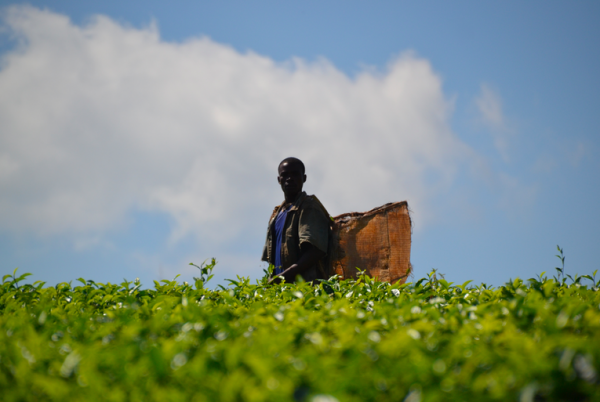 According to the Fairtrade Foundation, tea has been grown in Malawi since 1891, and Malawi is the second largest producer of tea after Kenya. We spotted pickers throughout the bushes, working tediously in the bright, hot sun.Once we reached the TAYO headquarters, the founders, Willird Mwambo and Titus Chipomba, updated us on the progress of Watering Malawi-funded school bathrooms and borehole wells. Colleen has worked with TAYO since 2009, and it’s obvious why. These guys have left no stone unturned, no question unanswered. They may be a small NGO, but they are smart and strong. They described the issues they face while completing various projects—headmasters demanding money from builders, village chiefs not getting briefed, parents committees and schools not cooperating—as well as the failures of play pumps (as tracked by PBS). They are problem solvers and take on the challenges with determination. After their presentation, we headed out to see the work with our own eyes, first at the same primary school that Willie and Titus attended as boys. On our way, people waved when we drove by (“We might be popular around here,” they joked). Because of a broken well on the property, the school’s 3,000 or so students spent two long years without access to water. But with Watering Malawi funding, TAYO fixed the well. Hoorah! We did a little pumping ourselves, and even GoGo took it for a spin. The water came out rather easily, but we know these women and children have to do it 5-6 times a day, and then carry the water-filled buckets back home on their heads. (I make a mental note to stop complaining about carrying the laundry basket down a flight of stairs once a week. )We also examined bathrooms in the process of being finished, as well as ones already completed. The finished ones shine with white paint and fresh red bricks, and feature hand-drawn signs that differentiate the boys stalls from the girls. It just happens that nature called while we were at one school, so I snapped a photo for you to see my view. So nice and clean!We also learned the common rule for deciding if a child is ready to start school. Children less than six years of age actually can’t touch their ears when they reach their arms over their head. In a world with few calendars to mark birthdays, this is a practical measuring tool.Tomorrow will be our last day, so we plan to browse the markets and sightsee. It’s truly hard to believe how much we’ve seen, heard, learned, and experienced in a single week! I’ve seen a lot of African schoolgirls this week, like this beautiful girl above. They’re vivacious, energetic, sweet. I can picture these kidnapped Nigerian schoolgirls, and my heart aches for them and for their families. Particularly disturbing are the reports that some have already been sold as child brides to Islamic militants. This deplorable practice is unfortunately very common. In fact, approximately every three seconds, a girl becomes a child bride.In Malawi, approximately 50 percent of all girls are married by 18; nine percent are married by 15. A child bride often stops going to school to become a servant to her husband, and she’s more likely to divorce, be widowed, or catch the HIV virus due to harmful traditional practices. Why does this happen? Sometimes a father offers up his daughter for marriage to pay off a debt or earn a dowry, without the daughter having any say. Or a girl may be encouraged to sleep with a man to please him, and then she gets pregnant and feels forced to marry him. A marriage bill has been written that would increase the legal age from 15 to 18, and President Banda pledged her support for it earlier in her term. But with the upcoming elections, the bill has been tabled. So with Malawi’s girls on our brains, we’re anxious for today’s meeting in Blantyre with the Girls Empowerment Network (GENET). Founded in 2008 by a woman named Faith Phiri (pictured below with Colleen), this NGO works hard to support and educate girls around Malawi, particularly vulnerable, marginalized ones. Through the work of several grassroots programs, they aim to eliminate abuse and violence in girls’ homes, build self-esteem and confidence, and empower girls to make their own choices. Colleen first read about GENET’s great work in this NPR story. She hopes to find a way for Watering Malawi to partner with them on water projects directly impacting girls. In our meeting with their team, we discussed school bathrooms that were in terrible conditions, as well as programs like Keeping Girls In School. One aspect of this program is the distribution of free, washable pads to girls so they don’t have to use old rags, torn mattress foam, and even banana leaves anymore. Many misconceptions surround menstruation, and girls often skip school during that time because they’re embarrassed, uncomfortable, and their bathrooms are insufficient. 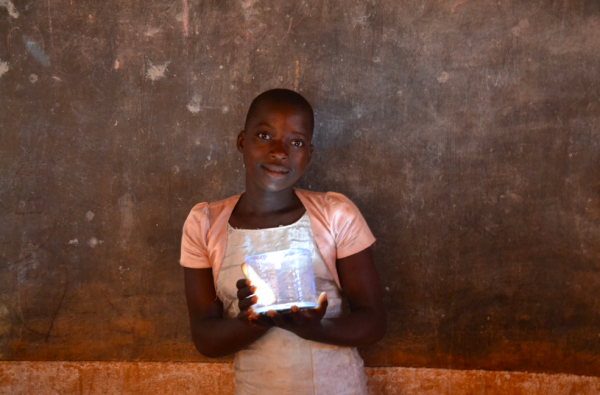 By finding small solutions for problems like this one, GENET is changing girls’ lives, one by one. You also might’ve heard of the “initiation camps” that occur in mostly rural areas, where elders in the community teach children false information about engaging in sexual activity at a young age. GENET has begun work to offer an alternative summer camp that teaches girls the truth about their rights and avoiding violence and abuse. In the non-profit world, it’s a documented reality that if you give a man a dollar, he’ll spend it on himself. But give a woman a dollar, and she’ll spend it on her family. By empowering women to claim their rights, understand and embrace their bodies, and share their knowledge, you change the future for everyone. After the adventures of yesterday, I felt ready for anything. But what I saw today and last night was mesmerizing. Why? Animals! So many African animals! Last night, we went on a night safari in the Liwonde National Park that overlooks a stretch of the Shire River. I felt like we’d been dropped into one of the nature shows my husband loves to watch.From our jeep, we spotted nocturnal animals like porcupines, plus more rare sightings of three bush creatures: a bush baby, bush pig, and bush buck. So many of these species were totally new to me, and we were seeing them in their natural habitat, rather than at a zoo. It was a beautiful thing. Did I mention the hippo mama and baby we saw just 20 feet from our car? That was enough to make Colleen and GoGo jump (hippos can be incredibly dangerous). The night ended with a bang when Amanda killed this poisonous baboon spider in our mosquito netting. She saved me!The fun continued the next morning as I dragged myself out of bed just after the sun rose for a private nature walk (with an armed guard to protect us from charging elephants and hippos). On the way, I was greeted my hungry warthogs and adorable veret monkeys. My guide, Duncan, filled my brain with dozens and dozens of facts about the trees, flowers, and animals—even elephant dung (which can be collected and used to make paper, among many things) along our path. How about this sausage tree, named for the fruit that hangs from it? Hilarious!The leaves and bark from certain trees are believed to help with fertility, strength, and a host of other health issues. One tree, the Moringa tree, is known as the Miracle tree, and you can even find Moringa powder in local pharmacies. After my walk, we took a boat safari along the river, spotting hippos, crocodiles, and fish eagles.And then Duncan spotted the most magnificent animal I’ve ever seen, the African elephant. He was in the bush, so Duncan cut the motor as we quietly floated closer. This park is home to more than 800 elephants, but you’re never guaranteed a sighting. We patiently waited for him to make a move, and when he did, all I can say is WOW. He moved so slowly, gracefully, and softly as he munched on grasses while a bird perched on his back. He knew we were watching him, and he gave us a great show.How do you follow up such an awesome experience? With another giant, beautiful natural creation! We didn’t plan on this one either. 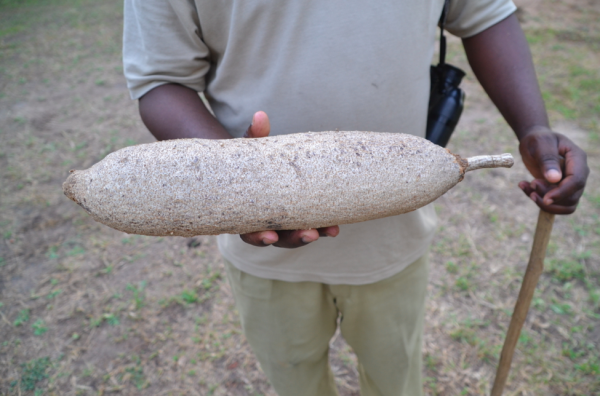 Our driver, Willie, had mentioned that on the way to Blantyre, there’s a tree with a root system that doesn’t end. We had to see it to believe it. It’s the only Banyan tree in Malawi, and it’s located on the campus of an Anglican school, so luckily, it’s protected. I couldn’t quite capture the tree’s size and beauty in photos, but it measures the length of two football fields. I can just imagine local children running through it, climbing, swinging, and exclaiming. I awoke early this morning to see the sun rise, and caught the last 5 minutes of it. I felt pretty tired, but throughout this trip, I’ve been pushing myself to experience as much as I possibly can. I wasn’t disappointed.On the way out of town, we picked up our dresses. We couldn’t believe how beautiful they turned out! When Colleen slipped into her dress, it fit like a glove. This tailor had added lining, darts, and zippers for each piece. But given our quick turnaround, he hadn’t finished the sleeves. Life tends to run on "Africa time" here, which is something Colleen has taught us. We couldn’t wait for the tailor to finish them, so we paid him the remaining Kwacha (Malawi’s currency) and decided we’d find a tailor to finish them in Blantyre.Today we visited World Vision projects in the field. We met the representative in charge of Chingale, who led us to see several projects funded by Watering Malawi. But on the way, we encountered a few transportation hiccups. The rainy season already passed this year, but today, the rains came anyway. When we travel between cities and within cities, we’re driving on paved roads. But when you head to villages to see water projects, the roads are dirt. And rocky. So when the rains come, they become more treacherous.While en route, we also learned that President Banda was campaigning in the very area where we were traveling!! We giggled like schoolgirls in hopes of seeing her, and immediately decided to put on our new Malawian dresses in the car just in case she saw us. A flurry of primping began while police directed us to the side of a dirt road to let her convoy pass. Colleen jumped out of the car to wave at her; I jumped too. A dozen cars passed, and we think she must’ve been in the one with the darkest windows. The whole experience was exhilarating (here we are, runny mascara and all).But then as we headed out on a new route to avoid traffic, we slowly fishtailed off of the road. The road was very busy, and another bus carrying loads of young men also slid off. Our driver hopped out to evaluate the situation and people gathered outside of the car, staring at us through the windows. I was tempted to snap photos, but didn't want anyone to notice my expensive camera. In certain neighborhoods in Chicago, this moment would’ve surely ended differently. But here, people tend to remain calm. Malawians for the most part are very peaceful people. 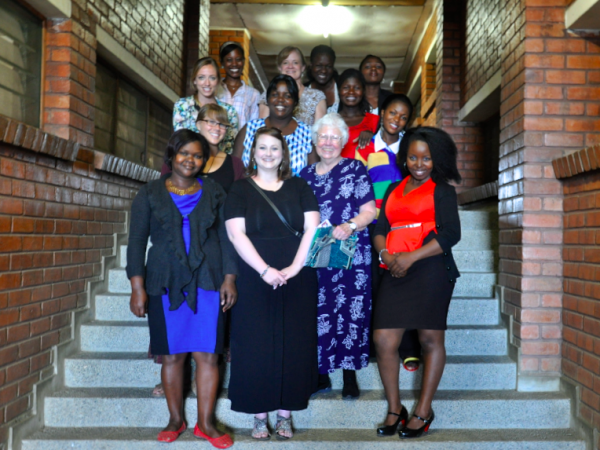 Colleen, her mother Charlotte (we call her GoGo, which is Grandma in Chichewa), and Amanda looked cool and collected. So I took a deep breath and felt much better. Lucky for us, President Banda’s back-up caterpillar was there to pull us out. And then just a few moments later, we’re stuck again. But this time I didn't feel as nervous. We knew it could've taken all day to get us out, but we had faith in our driver's abilities with a little help from some locals. By stacking rocks in front of the back wheel, we lifted the car up out of the ditch (I helped push!). Colleen described it from her perspective here.Rather than turn around, we pushed forward. After all, our work wasn't done and we were there to see a well and meet a mother’s club—the group of women who care for the well and educate the children about sanitation. We were thrilled that the mothers were willing to teach us each us how to use a cloth to hold a baby on our backs (As you can see, I was lucky enough to hold the chunkiest nugget in the village!). We may have had to use a translator to speak to one another, but it was clear that our women understood their women. Mothers speak an international language of love. We also meet a man who, with the support of World Vision, is raising thousands of fish for his family and his community. These people work so hard, and are so happy to share their work with us. Each day I’m more and more amazed at the beauty of this country. After one final breakfast in Lilongwe, we hopped in the car to head down south to Lake Malawi. As you can see, it was stunning. Doesn’t it look like an ocean? It’s longer and deeper than Lake Michigan (365 miles long compared to 307 miles, and in places, 2700 feet deep). It borders Mozambique and Tanzania, and its the southernmost lake in the East African Rift system. In the center of the first photo, you can see Bird Island, as well as a pair of men paddling the traditional canoe (you sit atop it rather than inside). The lake is filled with fish; the most common and popular is chambo (similar to tilapia). Many Malawian families vacation along the lake, and you can see why. 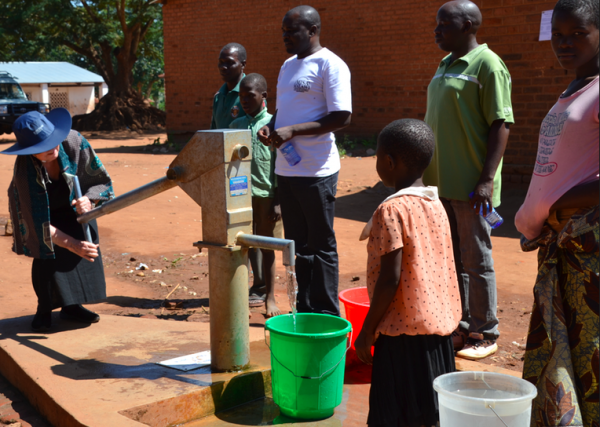 On the way there, we stopped by at an orphanage with Watering Malawi-provided hand-washing stations and bathrooms. As soon as we pulled up, the car was surrounded with children. They were happy and appeared to be well cared for by the women working there. Besides Madonna (who used her power to bend the rules), international adoptions from this country aren't permitted. It's because Malawians deeply care for their own. Side note: We saw the ground where Madonna's school was supposed to be built. It's untouched. This area also happens to be home for Colleen’s family. Her parents first moved to Malawi in 1962 as missionaries. They lived in a small village just steps from the water, where Colleen loved to swim as a kid. When we arrived at the village, we went to their church (here’s the story of what this church means to Colleen) and then spent the day with a childhood friend and his family. We snacked on local favorites like Fanta and cheese and tomato sandwiches. We also popped into a store in town where we picked out bright patterned fabric for custom dresses. This is the way many Malawi women fill their closets, working with a tailor to keep making new pieces throughout the year. A local man told me that men joke with their wives because, like American men, women are constantly ordering new outfits for celebrations and events. And even though it sounds extravagant, the price is totally affordable by our standards (we’re each paying $20 or less for fabric + tailor!). Where we shopped, tailors sit in front of the stores waiting for customers to buy fabric. We found one who was willing to make us each a dress (I asked for a top and a skirt), and because we’re leaving town tomorrow morning, he has to work fast. We drew pictures of the design we wanted, and then he measured each of us. We can’t wait to pick them up! As we pull into the small village, the women surround the car, dancing and singing and making the most gloriously joyful noise. We step out of the car and join in the celebration, and I feel so purely happy that I start to cry. The feeling is overwhelming and surreal (watch it here). That moment today will be seared in my memory forever. We spent the day with a group of local leaders connected to MATAMA, first meeting the director of public health at a district hospital who explained that, among many things, he’s seen a vast improvement in access to HIV/AIDS medicine in the area. We broke from meetings to indulge in a traditional lunch of nsima (a cornmeal and water mixture akin to grits) roasted chicken, beef and vegetables—all of which we ate with our hands. Our driver Willie showed me how it's done. It was messy, but surprisingly tasty. Following lunch, we headed to a remote village for a celebration. What was the occasion? We were praising the fact that 10 villages had successfully completed training to make their villages free of open defecation. How’s that for perspective?!! This meant that the chiefs of 10 villages were willing to adopt clean water hygiene and sanitation practices to help make their people healthier. They instructed the men in their villages to build toilets and women to help them teach the children how to use the toilets and wash their hands in clean water. Amongst the 200-ish people present, men and women who had led their villages were presented with certificates of achievement. They were dressed in their best clothes, and they beamed with pride upon receiving their certificates. To us, a simple piece of paper can be just that. I can’t count the number of certificates I received in grade school. To them, it was a great honor, as it should be. They'd cleaned their homes from top to bottom in anticipation of our arrival, and you'd be amazed at how beautiful it looked given they're resources. The women performed songs that told the stories of what they’d learned, and they stepped and swayed to the leader’s beat in perfect syncopation—intermixed with some seriously awesome twerking (see above). I could’ve watched them perform all day long. And the children were most mesmerized by our cameras. I took photos and showed them to the children. They couldn’t get enough, and swarmed around me to keep snapping more and more. PS: Have I mentioned the sunsets here? Cause they're kinda gorgeous. After a long night’s rest under mosquito netting—which felt magical and odd all at once—we awoke with warm(ish) showers and a spread of delicious breakfast food. Our first meeting was held at the national headquarters of World Vision Malawi. We met with a woman named Lucy, head of MWASH, which stands for Malawi Water Sanitation Hygiene. Since 2006, Watering Malawi has been partnering with the organization to access clean water and sanitation—everything from toilets and hand-washing stations to fish ponds. MWASH is large-scale, long-term program with many organizations involved, but as Lucy explained with a deep sense of gratitude, “Colleen, you brought MWASH to Malawi.” It was a touching moment to witness (no doubt many, many more will follow). Talk turned to a new program that World Vision is launching in other countries called Strong Women, Strong World. It is currently in Mali, Niger, and Rwanda. Watering Malawi is interested in furthering a conversation with World Vision Malawi about how to leverage the work we are already doing to empower young girls. Lucy had copies of new reading materials they were distributing. What’s the connection to water? It is hard to teach water and sanitation hygiene to people who don’t have a basic education. The concepts around the importance of healthcare are too complicated to grasp. So we discussed the development of literacy programs with young girls (exciting! ), and we compared a Watering Malawi-designed coloring book with primary school pamphlets designed by World Vision. Before we left, we laughed about a wrap Colleen wore on her last visit. Lucy remembered her wearing it because it was a very dated print. Yes ladies, fashion is everywhere! New Malawian prints come in and out of style. Just like us, Malawian women love color and design in their fabric. So with fashion on the brain, we set out to discover a little place with a brilliant name: Smart Lady Boutique, run by a strong woman (notice a theme here?) named Rwinda. We practiced our bargaining skills at the local markets, then filled up on fried chicken and fries from Chicken Land (Malawi’s Chick-fil-A) before heading to our next meeting with another organization on the forefront of water education. At MATAMA (Mineral and Appropriate Technology Applicable in Malawi), we met the executive director, Mr. Mapulanga, who took us to a school in the city. 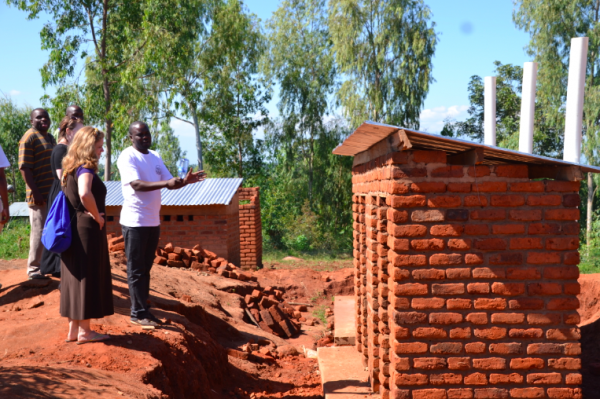 Watering Malawi has partnered with MATAMA to put new bathroom and hand washing stations there. This statistics from this school are staggering, so prepare yourself. This school has 8,725 students (almost three times the size of my college! ), 108 teachers, 32 toilets, 2 hand-washing stations, and 1 spigot for gathering fresh water. Yes, 1. Each classroom is about 20’ x 25,’ and on average, 400 students cram into the space. To handle the growing population, they’re building additional classrooms. But space will forever be an issue as over-crowding in the city remains a problem to be addressed on many levels. The toilets contained urinals, both for boys and for girls. Girls and urinals? (I asked). Girls squat to go to the bathroom (and they aren’t familiar with commodes), so urinals ensure that the run-off is collected somewhere sanitary. Wow. As we gathered under an acacia tree with school board members, advisors, and head teachers, we listened to each person express their thanks for the work of MATAMA sponsored by Watering Malawi. But as Colleen explained, we weren’t the ones to thank. It is the gifts raised by young girls and boys from Boston to Hawaii who’ve made it possible. When the time came to leave the school, children ran up in packs, cheesing for photos and goofing off as they do. It was a wonderful reminder that children are children, no matter where they live. What separates us is merely a matter of where we’re born. In the wake of last week, I've decided that the only way to move forward is to do just that: by saying yes to adventures (both literal and more figuratively) that lie ahead rather than focusing on the past. So when a last-minute weekend press trip came my way, I accepted with excitement. This one was for a "girls' adventure weekend" at the five-star resort in Kohler, Wisconsin. Led by author/chef/Girl Hunter Georgia Pelligrini, the experience was filled with both creatures (hunting, fishing) and comforts (delicious meals, luxe hotel rooms with heated bathroom floors). The women participating came from a range of hometowns, backgrounds, and ages (late '20s to 69), but they shared one characteristic: fearlessness. Inspired by their willingness to try anything, I stepped right up to learn how to shoot a shotgun. Was it pretty? Heck no. Did I accidentally fire into the ground and startle myself sick? Yes. It was embarrassing to say the least. But this was an accepting group who pushed each other to keep trying, even though they'd only known each other briefly. While they hunted pheasants in the field, I did my part to snap photos and gather switchgrass for a pretty bouquet. And when they cleaned the birds, I immediately grimaced before reminding myself of the importance of knowing where our food comes from. I buy meat in the grocery store that I don't know much about, but this meat was fresh and natural. Georgia explained how to use the entire bird (feathers, bones for stock, etc), and we all listened in amazement. The weekend was inspiring, informational, and the perfect reminder that some of life's greatest lessons come when you least expect it. My girlfriend Sara and I have a thing for discarded windows. They're practical but also pretty, in a rough-around-the-edges-kind-of way. They hint at past lives where they hung in other people's homes, where children and adults and pets all stared through the same panes of glass at the world beyond. When I see one propped up at a tag sale or discarded in the trash, I can't help but picture its story. In this video, a couple share how they collected old windows to create an entire wall for the cabin they built in the West Virginia woods. They saw a window of opportunity (well, a ton of windows), and they took it. Take a look.